Wind pollination (also called 'Anemophily') describes the process of the transfer of pollen from one individual plant to another, whereby the pollen is carried by air currents. Plants may be 'gymnosperms') (non-flowering) – common in grasses and grains, or 'angiosperms' (these have flowers). However, any flowers produced are not scented, nor do they produce nectar. What is the difference between wind and insect pollinated plants? are not scented - there is no need to attract insects with scent. have no nectar (an important food reward for bees and other pollinating insects). they have small, inconspicuous or dull petals - there is no need to attract insects with bright colours. these plants produce a lot of pollen to increase the chances of pollination. It is also very, very light in texture, so that it is easily blown on the wind currents. pollen produced by these plants is of very low nutritional benefit to insects. It has low protein content, and usually will only be gathered by them when other pollen sources are scarce. Male part of the flowers (anther and filament - which together are called the 'stamen') are designed to expose pollen to the wind - in this way, pollen can easily be blown by air currents. The filaments are often long (or at least dangly), with anthers dangling on the end, thus exposing the pollen to the air currents. Female parts of flowers (stigma) are long and feathery, and so they are ideally designed to capture the pollen as it is blown on the currents. Many important trees are also wind-pollinated. Wind pollinated plants are adapted to ensure that grains of pollen can easily be carried by the wind from male to female parts of flowers, to ensure fertilization can take place. The pollen of this plant group of plants is most frequently associated with symptoms of hayfever among those sensitive to pollens. 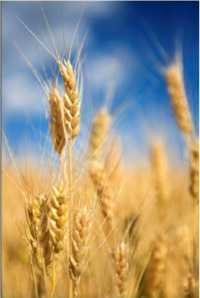 Wind pollinated plants are very important, and are used to make a huge proportion of the staple foods we eat, such as bread, pastry for pies, cornflakes and so on. 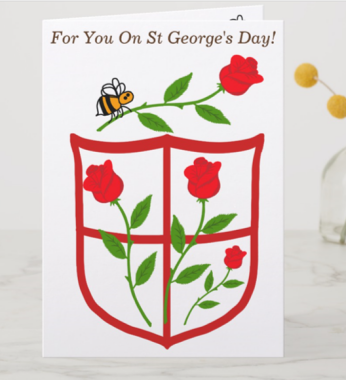 However, they are greatly enhanced by products pollinated by insects, such as the fruit that is used in preserves for your bread, the fruit that fills the pies, muffins and so on. 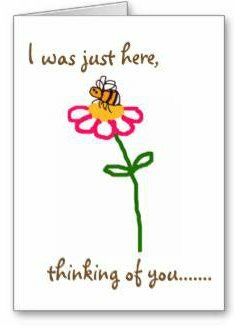 Because the pollen is so light, it is possible that it can be picked up by passing insects like bees. As bees fly through the air, their bodies become negatively charged with static electricity. Pollen in the air can thus stick to the furry coat of the bee, but unless the bee lands on a female part of the the same flower species, this doesn't help the plant. However, wind pollinated plants typically produce a lot of pollen, to increase the chances of pollination by wind in any case. Go to main links, including insect and bee pollination. 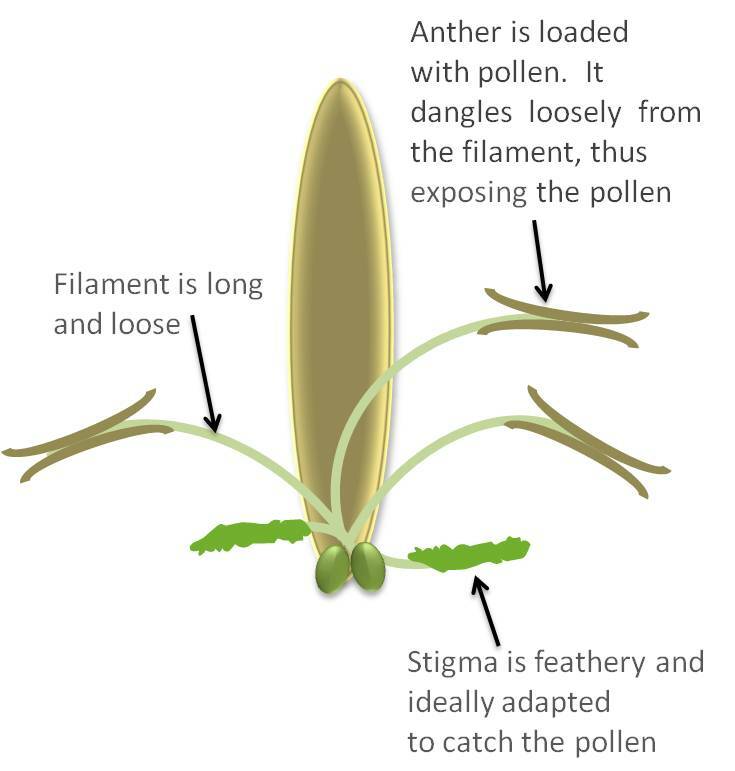 Discover more about plant pollination, with a diagram of the process. How are plants adapted to encourage visits from their target pollinators. Link back from Wind Pollination to Home page.